MoFA has built a special network for one of its primary constituent groups: the Artists’ League was formed in the Fall of 1986 as a meeting place for discussion, exchange of professional information and critical commentary, and the Museum supports artists who, in turn, support the programming of the Museum. 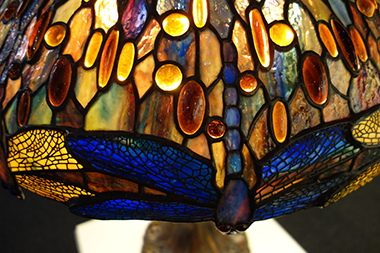 Susan E. Frisbee, Detail of Dragonfly Lampshade, stained glass. The design is styled after the work of Louis Comfort Tiffany. Self-help seminars, workshops with guest lecturers, exhibitions at other regional sites, the annual summer exhibition – the Artists’ League Summer Annual, and other opportunities continue to be explored by Artists’ League members who vary the format of their juried exhibitions, sometimes selecting a topical focus, sometimes highlighting guild sub-organizations and at all times celebrating individual ways of working.